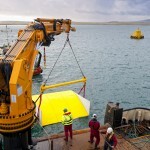 CoRMaT is a second generation tidal energy converter, the result of extensive research and development carried out at the Energy Systems Research Unit at the University of Strathclyde. It is a contra-rotating turbine, suitable for deployment in water depths of 8 to 500m. CoRMaT uses two closely spaced dissimilar rotors, moving in opposite directions directly driving the rotor and rotating stator sections of an electrical generator. Station keeping is undertaken via a tensioned mooring system. 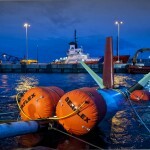 The device has progressed through systematic Technology Readiness Level development steps, and has successfully generated electricity in a marine tidal setting. The full scale system underwent testing at EMEC’s Shapinsay Sound test site during 2014. 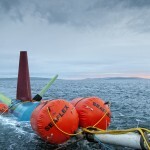 In 2015, Nautricity signed up to a grid-connected tidal test berth at EMEC’s Fall of Warness tidal test site. The 500kW CoRMaT turbine was installed in April 2017. As of March 2018, Nautricity are recovering the turbine after an extended period of deployment to investigate and analyse the turbine, supporting systems and data to assess the impact of extended exposure. The testing period at EMEC has been supported by the Interreg NWE FORESEA project, which enables free access to EMEC’s test facilities.